Banners.com printed vinyl banners for Austin's Journey. Austin's Journey is an organization that helps bring awareness to real problems that many young people struggle with today. Some of the main issues include substance abuse. The organization has a vehicle equipped with high-resolution TV screens, built in poster frames for event information, and high impact banner signage space. 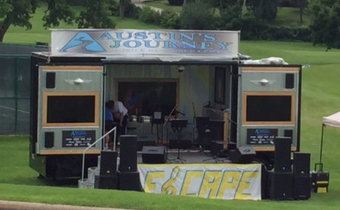 Here are some photos that Austin's Journey sent us. Thank you very much for sending us the photographs of the vehicle. For more information about the organization, visit the Austin's Journey Facebook page.